The RODE NT1-A 1" cardioid condenser microphone has become an industry standard; delivering the warmth, extended dynamic range, clarity and high SPL capability typically only featured on some of the world’s most expensive microphones. With a self-noise level of only 5dBA it is widely recognised (along with the NT1) as one the world's quietest studio microphones. This low noise makes it an ideal for vocal microphone as well as perfect for recording guitars and percussion. A studio grade pop shield and shock mount is included, along with a premium 20' microphone cable, dust cover, and an instructional DVD packed with recording tips. 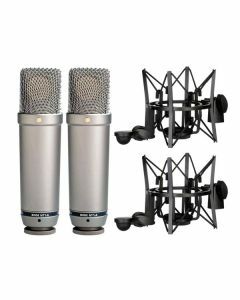 The RODE NT1-A large diaphragm 1" cardioid condenser microphone is designed and made in Australia, and covered by RODE Microphones' industry leading 10 year warranty.